It was as a junior junior cop that I fist recall that sinking feeling of being wrong. I recall someone asking me directions to the general store. I pointed them up Main Street, then, as soon as the man was out of sight, realized the store was down the street. I ran inside the t-shirt store and hid with my parents. Another time I got my traffic signals mixed up, and when I realized I dropped my arms and stood in a shadow. Fortunately Officer Mark was there. This morning I finished my painting. I dabbed in some darks in the trees, ultramarine shadows on the buildings, and developed the water further. I recently got a Princeton Neptune #12, and used it for the first time today. A nice brush. I loved the quill I had already, but wanted a little more precision while keeping the looseness that these brushes engender. I liked it on the sail, where I tried to learn from John Singer Sargent’s “Melon Boats.” I found it helpful too when painting the sailors. To finish off the painting I scraped out the highlights and lines on the boat. 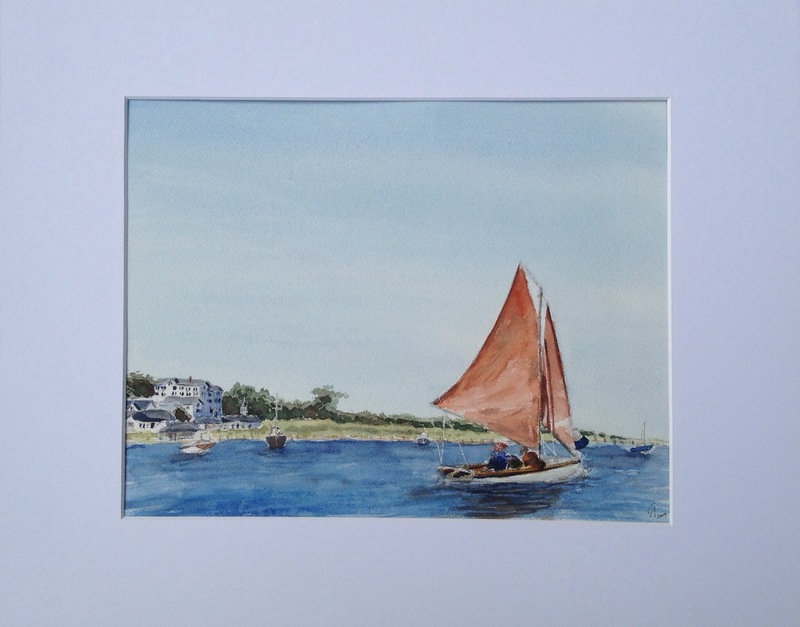 This was a fun painting to do, and a good way to remember Edgartown. I have a few more in mind for this series, and a few more stories to go with them. Very nice, great perspective & colors! Corey, this is wonderful! Not only is it beautiful to look at but it really captures the feeling of the Vineyard and the freedom of being on the water. Plus I like how you’ve put all of the vibrant colour on the boat and water and the grass and house is more muted. Really like this one. Very, very nice, Corey! The way you handled the horizon architecture and enveloping foliage looks just like an Edward Hopper watercolor–one of my all-time favorites. You have quite an eye for translating the world onto the watercolor page. Thank you! Without your tip at the start about Hopper this might have looked pretty different. Always learning, but I feel like I am slowly getting closer to a style of my own as I draw from Hopper and John Singer Sargent and your influences along with my literary heroes.